Well, I've enjoyed this bike a lot since I picked it up last September, but I just bought a new FZ-10, so this one has to go! I'll get some more pictures if we have some decent weather, but this is a very clean bike! When I got it it had a little over 14k miles on it and it's up to 15,370 right now. Overall the bike is in great shape. There is a scrape on the clutch cover that was there when I got it. Yoshi exhaust, dyno tuned and jetted (before I had it). It runs perfectly. Mosfet R/R was also done by the previous owner. When I got it I did an oil change with Mobil 1 and replaced the front brake and clutch reservoirs and flushed both, changed the grips and bar ends, put on Proton signals in the front and drop in LED's in the taillight along with rear LED signals and replaced all of the instrument lights since a couple were burnt out. At this point the bike needs nothing and is ready to ride! Asking $3200 obo, located in Orlando, FL. Nice VTR, good price too. Good luck selling, it's worth every penny. Wow, very clean, not sure about price but shiny new-like! FZ-10 gets even worse gas mileage but surely will whip it good! I kept my fastest red 107k mile 98 and got a FJ-09, older but littler brother to the FZ-10 and still real fun and a much more practical and economical choice for long days in the saddle; though about 20% less fun than a FZ-10 before they take your license away. Smiles per gallon much more important! I've still got this puppy! Someone give it a home! 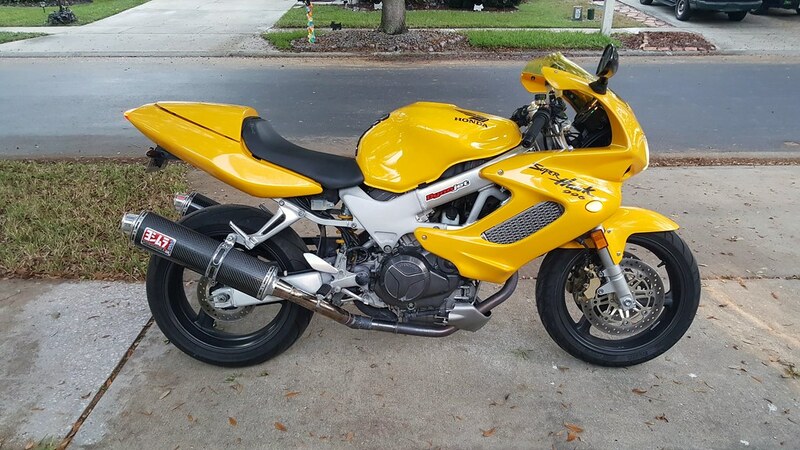 Quick Reply: Yellow 2000 SuperHawk with 15k Miles For Sale!